Our signature product Bilock, are now producing stainless steel sidebars that increase the drill protection of all cylinders. Not only is this product bump proof and virtually pick proof but it is also extremely drill resistant and thanks to the inclusion of stainless steel sidebars, more so. The ability to master key these cylinders without using pin stacks greatly improves the security and pick resistance of any master keyed cylinder. All locksmiths will explain to consumers that general or mainstream branded pin tumbler cylinders, when master keyed, greatly reduces the security and increases the pickability of the cylinders. 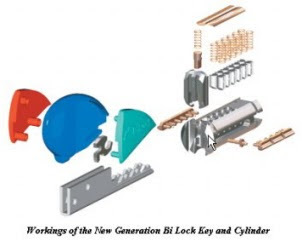 Bilock continue to push the boundaries of modern mechanical key systems and are constantly looking for micro improvements that protect the marketplace. We have been extolling the virtues of the fabulous Meroni product line recently and we now continue with a deeper look into the brilliantly designed and extremely easy to operate Pigio line. The first picture shows an active example of a Pigio in use. There are three (3) versions of the modern Pigio line. 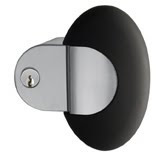 Pigio 3 pictured next is a sleeker more streamlined oval shaped handle that is slowly becoming the sought after alternative to lever handle hardware. Pigio 2 is another version of the hardware that may appeal to discerning consumers. Pigio 1 is the classic original that is more rounded is design. We are the exclusive importer of these products in the USA. All these products surpass the rigid ADA rules and regulations for commercial and residential doors. Pushing or pulling the handle operates the mechanism. Simple design, intelligent idea and simple to operate. All versions are available in multiple colors and finishes, to suit the most discerning tastes. 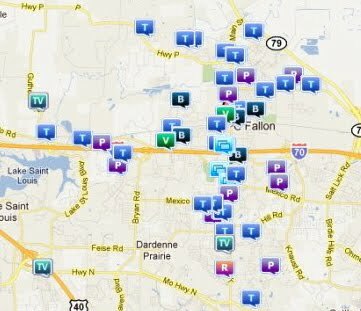 Here is a mudmap of the crime statistics reported by the O'Fallon Police Department for the 14 days August 14 - 28, 2011. We found 54 incidents for this time period. 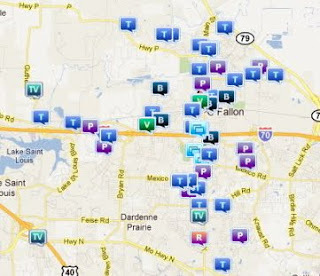 There are multiple different incident layers to choose from displaying incidents, we choose to look at Breaking and Enterings, Theft, Vehicle Theft, Robbery, Alarms, Commercial & Residential Property Crimes and Community Policings. These records are for only a 2 week period, but they do indicate an escalating crime rate compared to other localities. Whereas there are only 6 Break & Enter records, the Commercial and Residential Property Crimes and incidents of Theft could have occurred with no sign of forced entry. That could indicate possible inside access from dishonest keyholders. Do you know who has all your keys to your home or business? If not, wouldnt it be fair to want to restrict the quantity of keys floating around that could potentially get into your property? Master Key Systems America LLC are securing American doors, one at a time. Our technicians are especially trained to provide services that enable property owners and tenants to feel secure by using premier quality products and services. All estimates/quotations are FREE. Please call us to arrange a no obligation security assessment and estimate. We recently started training a new person who resides in the O'Fallon, Missouri area. He is a very capable trainee and learning very quickly. The quality of his work is excellent (in some ways better than mine). We are pleased to make our locksmith services available to clients in the surrounding areas for the still competitive rates we have become known for. Now, serving customers in St Charles county will be quicker and more easily gotten to. For emergency unlock services in O'Fallon, St Peters, St Charles, Lake St Louis and surrounding areas please call our sattelite bureau on (636)614-4416. Okay! 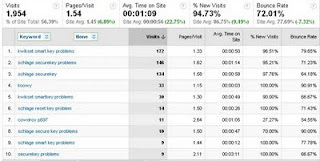 here are the statistics from Google Analytics that indicate the top 10 popular search terms people used in search engines that lead them to this site, during July 2011. 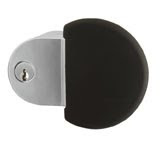 Kwikset Smartkey Problems leads the field during July followed closely by Schlage Securekey Problems. However Schlage is mentioned 5 other times in the top 10. The knowledge that Schlage has decided to discontinue their Securekey line omens well for consumers. No more trash can quality product will spell a more content marketplace. 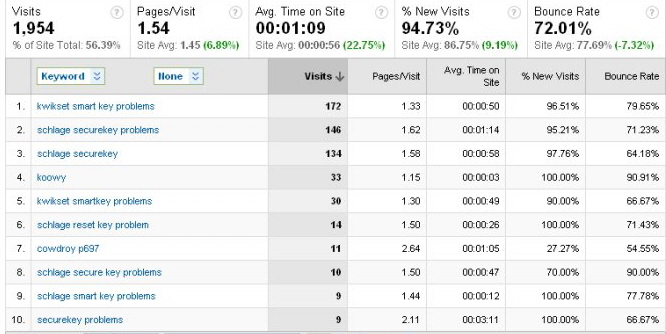 Nearly 2000 searches in July with a bounce rate of 72% indicates that many people are finding suitable answers to their search queries here. We have noticed a slight uptick in projects completed in July and August has proved stellar too. We put this down to consumers becoming more savvy in their searching and realizing that we at Locks210.com can actually complete their requested projects in more timely and cost effective methods than many of our competitors. Tom Gorham, a fellow member of the Society Of Professional Locksmiths has achieved what no one else was able to. He opened this 130 year old antique safe. This safe is located in an old cannery in Washington DC. It hadnt been opened for many years and the owner refused to have it drilled open. Many supposed experts tried and failed. The owner was almost convinced it was not going to open. That is until Tom from Lock Doc came along. He succeeded where all these other supposed experts failed and with no damage. The Society Of Professional Locksmiths is an organization of locksmiths dedicated to providing first class education and training to locksmith trainees. The society also promotes fellowship between locksmiths. It is fast becoming the preferred organization for locksmith professionals. There are other locksmith organizations that have existed for many years, but this relatively young group of like minded professionals is giving locksmith professionals, opportunities to interact with peers unlike the other "clubs". We will close August 30, 2011 for vacation. We will reopen September 8, 2011. We apologize for any inconvenience. As we will be traveling abroad, we will be completely out of touch for this time. Your custom is important to us. Please contact us to schedule future projects. 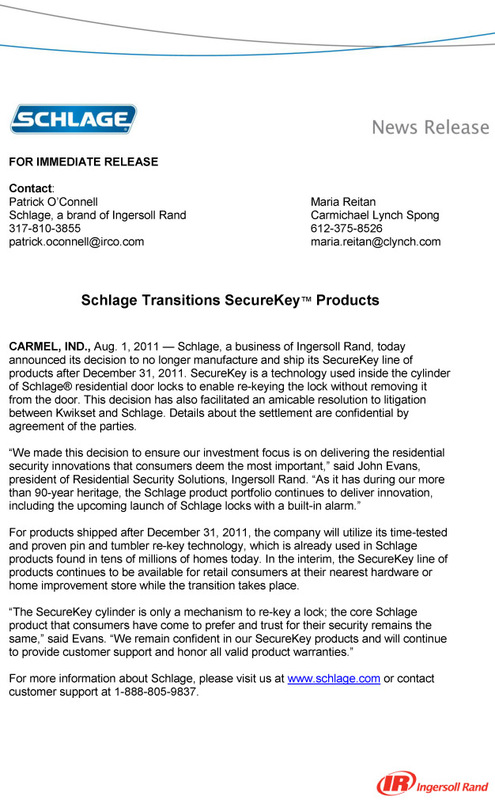 August 1, 2011 - Schlage manufacturing have announced they will discontinue the Securekey product line Deecember 31, 2011. According to an Ingersoll Rand manager involved, Schlage will replace all their product line with the tried and tested conventional pin tumbler system in use for over 90 years. Securekey will continue to be supported until December 31, 2011. There have been reports in the media, over the last couple of years, of a patent suit brought by Kwikset against Schlage for infringing certain aspects of the Smartkey technology. 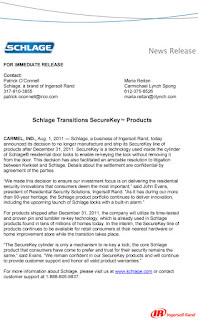 Perhaps this contributed to Schlage's decision to dump the product in the face of mounting criticisms about the insecurity, ease of bypass and bumping that this product was supposed to have countered. Consumers might begin to see big box hardware chains discounting the product to clear the shelves. 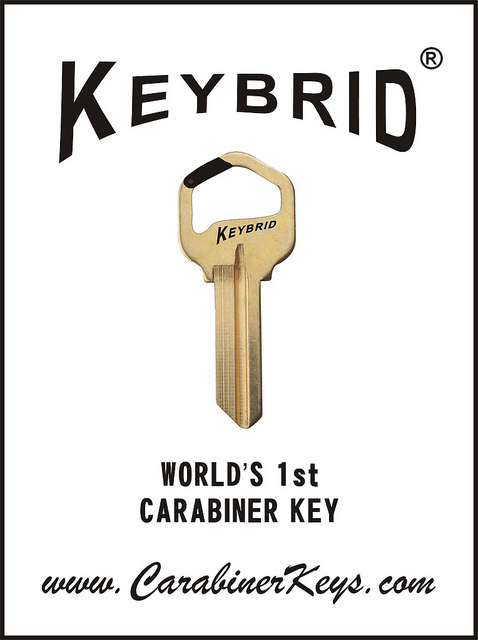 A new keyblank has surfaced invented by an enterprising young fellow that solves the ages old dilemma of broken fingernails and tough to install/remove keys from your favorite keyring. 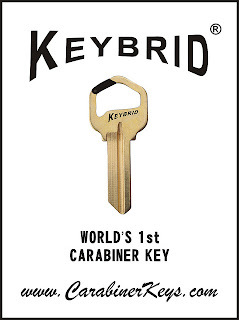 The keybrid is an especially made keyblank with a spring loaded arm that acts exactly like a carabiner. It is my understanding that this product will be produced in various key profiles and will likely be a much sought after alternative for fashionistas who wish to protect their nails. Assa Abloy Asia Pacific, who own internationally reknowned Australian lock manufacturer Lockwood, recently delivered the future Australian standard commercial mortise lock. The revolutionary design is a vast improvement from previous models. Our new product line the fabulous Serrature Meroni - Combina, direct from Italy was showcased a few years in Europe. See how easy it is to operate this handle? It will surpass ADA requirements in both commercial and residential markets. The simplicity of design ensures easy operation by anyone. 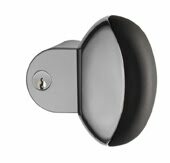 No more twisting your hand to open your door, this stylish design is surprisingly, competitively priced compared to mainstream products available elsewhere. We also offer the entire range of Serrature Meroni products. The choice of colors and styles is impressive. We will be showing their range in upcoming features! Wholesale opportunity for fellow locksmiths only.